Combustion Operations | Mitchell Scientific, Inc. Processing combustion monthly fuel consumption data to calculate combustion emissions Emissions Accountant is fairly straightforward. 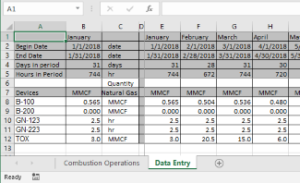 The user only needs to maintain the monthly fuel consumption records in an Excel workbook that can be formatted as needed to be read by Emissions Accountant directly. The image immediately to the left shows the boilers, generators, and thermal oxidizers in addition to the fuel consumption records. Fuel consumption quantities for other months may be entered into other columns that correspond to the different months. A link to download an example Excel Workbook that can downloaded and revised as needed to accommodate tracking needs. Once the monthly fuel consumption records have been entered in the Data Entry worksheet then it can be linked to a second worksheet for importing directly into Emissions Accountant. The image immediately to the left illustrates how the monthly data is formatted for processing by Emissions Accountant. EA Folder: The name of the group folder in Emissions Accountant were the emission record will be stored. If the folder name provided in the field can not be located the Emissions Accountant will offer to create the folder. EA Process: The process record in Emissions Accountant where the batch record will be entered. If the process record can not be located then the software will offer to create new process record with the name that has been provided. Batch Name: Actual emission records that are entered into Emissions Accountant are tagged with a batch number or name. Activity Title: When the emission model defined by the row is calculated then this text is used for the Activity Title of the model. Equipment: The boiler, thermal oxidizer, generator, or other equipment where the fuel was consumed. Start Date: The beginning calendar date to be used for the emission record. End Date: The ending calendar date to be used for the emission record. Fuel: The fuel that is consumed by the combustion operation needs to be present in the chemical database. When the combustion model is calculated then the quantity of fuel that is consumed is summed for all of the models for reporting purposes. Consumption: The numerical portion of the quantity of fuel that has been consumed. Units: The measurement portion of the quantity of fuel that has been consumed (gal, lb, kg, MCF, MMCF, etc). Factor Name: This string refers to the predefined emission factor record contained in the Emission Factor Database. Vent ID: [Optional] If a Vent ID is to be entered for the emission model then this field should be completed. If the same Vent ID and equipment combination can be located in the Vent Path Database then Emissions Accountant will automatically enter the list of control devices that are contained in the vent path record for modeling purposes. If a corresponding record can not be located in the Vent Path Database then only the Vent ID will be specified in the model.